Even when we're old, God can still use us. 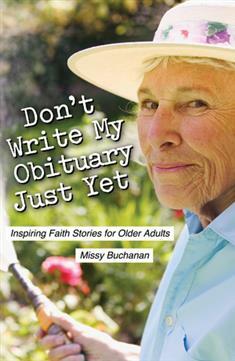 In Don't Write My Obituary Just Yet, Missy Buchanan will warm your heart with her stories of older adults living with a sense of purpose and gratitude for the life God has given them. As Buchanan writes in the introduction, "Good stories leave an imprint on our hearts and inspire us to live differently." The 30 stories in this enlarged-print book give us glimpses into the lives of ordinary people ranging from 70 to 100 years old. Some of these folks are active; others are dealing with physical or mental decline. All exemplify how strong faith can help us overcome struggles and sorrows and live in hope. A scripture and prayer accompany each story. This book will uplift any older adult who needs to know that their life still matters to God and others. It's also an encouraging guide for middle-aged people wondering how they can live meaningful lives in their later years, even if they are ill or frail. This book will uplift any older adult who needs to know that their lifestill matters to God and others. It's also an encouraging guide for middle-aged people wonderinghow they can live meaningful lives in their later years, even if they are ill or frail. The 30 stories in this enlarged-print book give us glimpses into the livesof ordinary people ranging from 70 to 100 years old.